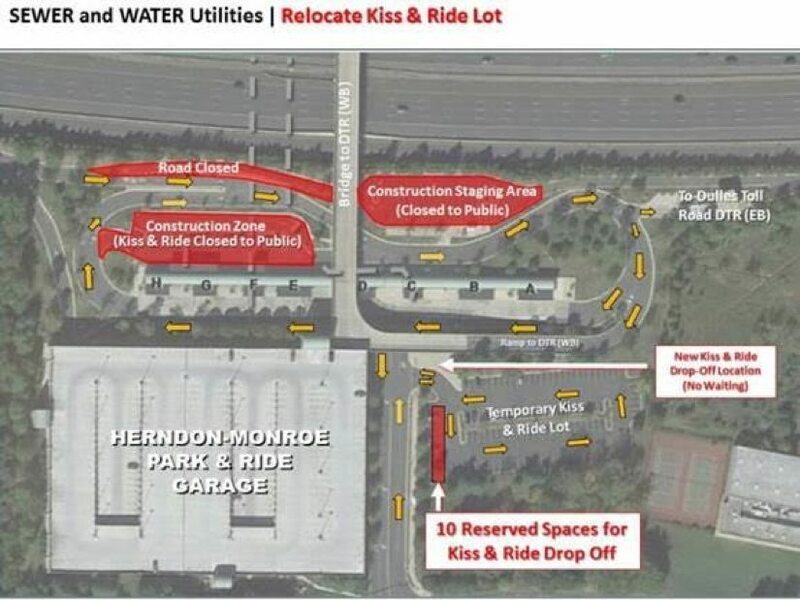 The Kiss & Ride Lot at Herndon-Monroe Park & Ride will be moving to a new temporary location, effective Monday. Construction activity for Metro’s Silver Line phase 2 is expected to begin this weekend. Crews will be clearing the area needed for the installation of the water and sewer utilities that will serve the future Herndon Metro Station now under construction in the median of the Dulles Toll Road/Airport Road. A temporary Kiss & Ride lot will be will be located in the surface lot directly across from the Park & Ride facility’s garage entrance. 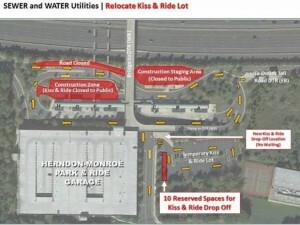 Ten parking spaces have been reserved for Kiss & Ride Drop-Off. Vehicles entering the temporary Kiss & Ride Lot will turn right and follow a counter-clockwise pattern through the lot. To access the Temporary Kiss & Ride Lot from the Eastbound Dulles Toll Road, take Exit No. 11 and stay to the right. Follow the directional signage to the Temporary Kiss & Ride Lot. Phase 2 of the Silver Line, including stations at Reston Town Center, Herndon, Route 28, Dulles International Airport and Ashburn, is expected to open in early 2019.